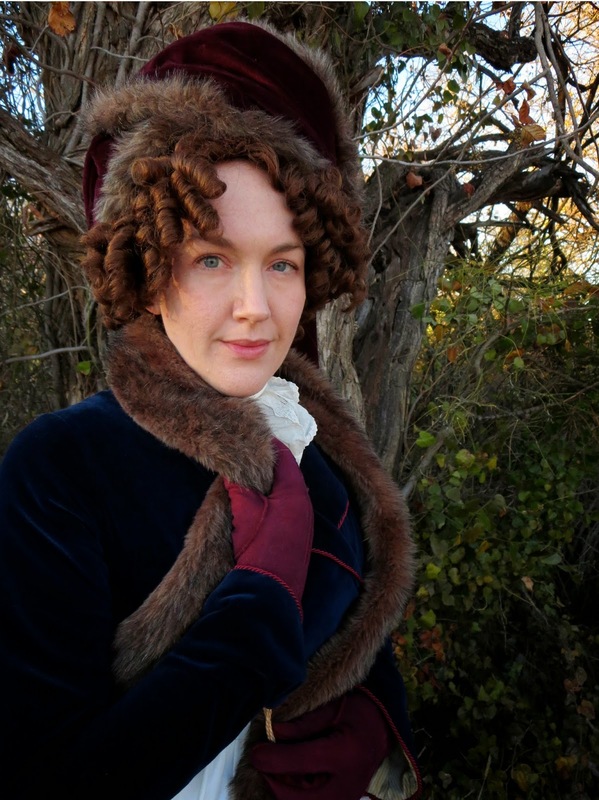 A few weekends ago, the DFWCG had its annual Georgian Picnic, and I decided to make some new cold-weather accessories to dress up my old 1790's spencer and round gown. 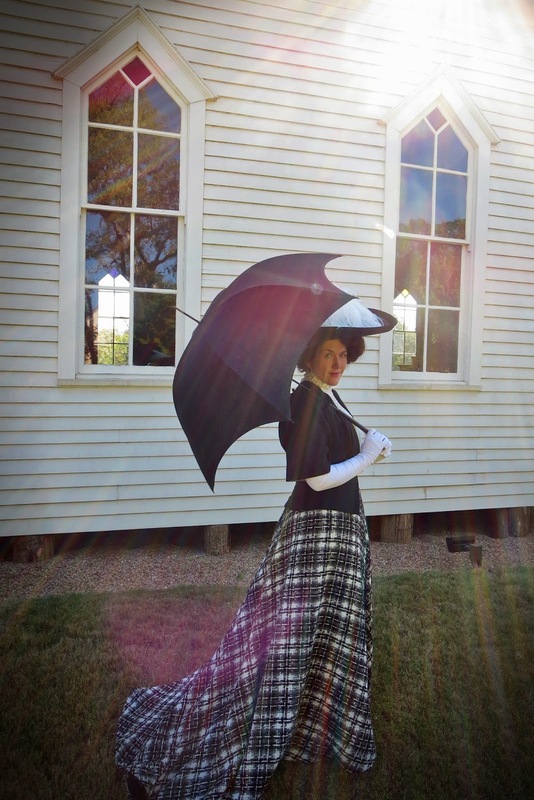 Unfortunately, I ran short on time and had all sorts of unforeseen drama that weekend, so my fancy new accessories did not get finished and I ended up with a very boring outfit for the picnic. *blah* But I was so excited about what I was working on that I decided to give it another try and finish everything so I could at least do a photo shoot and share my projects here. 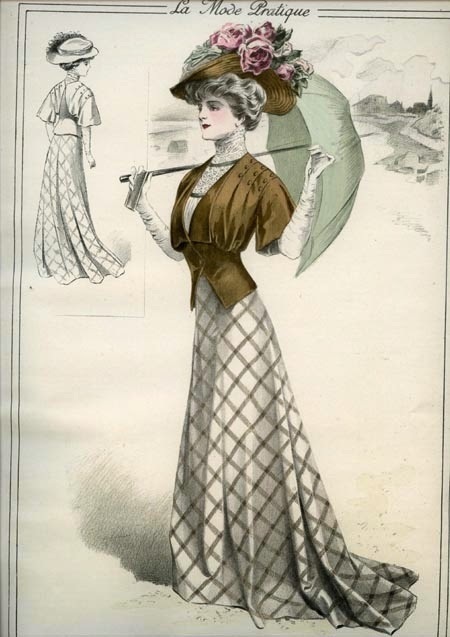 I spent lots of time pouring through Gallery of Fashion illustrations when coming up with ideas for my new accessories, and all of those plates can be found on the Bunka Gakuen archive, which is an invaluable resource for studying costume of this era. First on the list was a new fixed turban. 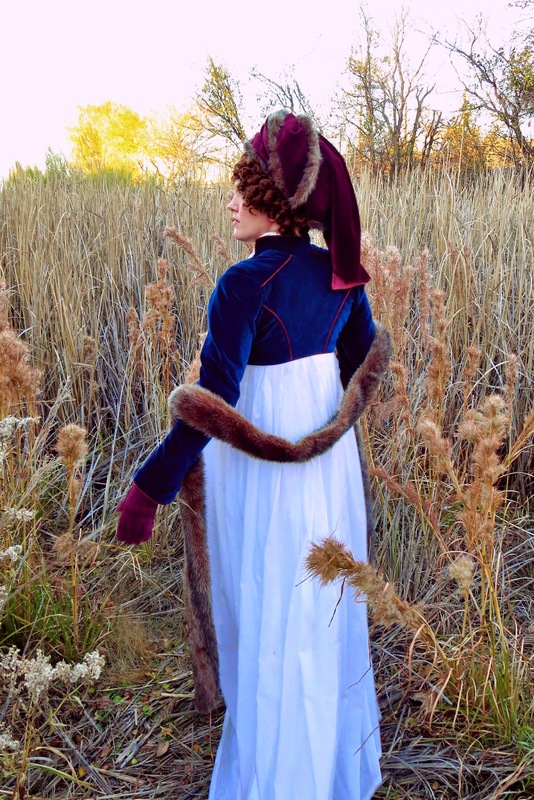 The construction was very similar to the turban I made last summer, but this one has a 3-yard strip of velvet wrapped around the crown, which made it much rounder and taller than my first version. I didn't get a chance to decorate it before the picnic, so it was painfully plain during its first wearing. To add a bit more excitement, I added strips of fur to the twists and a drape in the back, and I like it a million times better now. 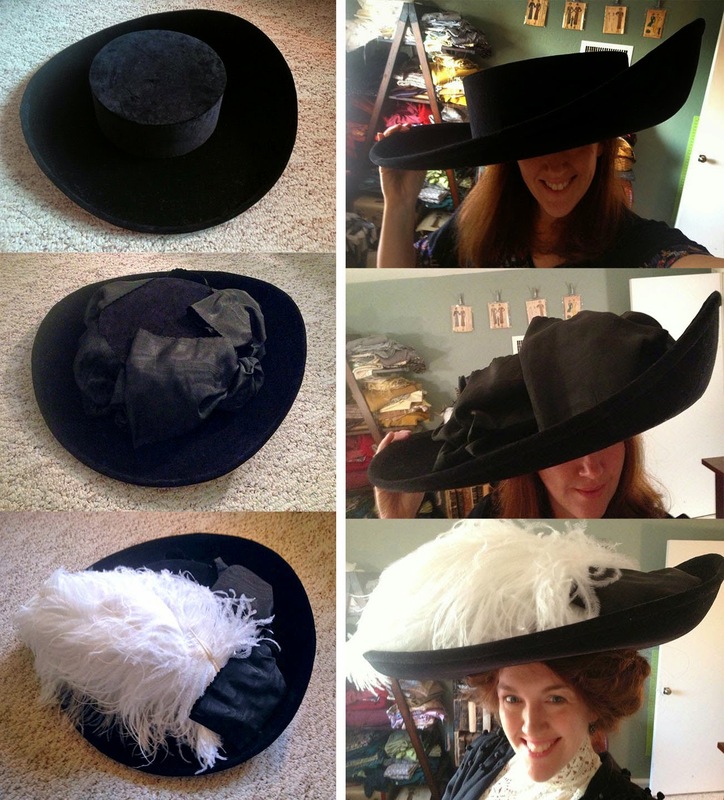 It just goes to show how important those finishing touches are when making hats from this era. I used a straw hat as the base for this turban, and everything is tacked into place by hand, so it would be easy to change again in the future if I wanted to try something else. 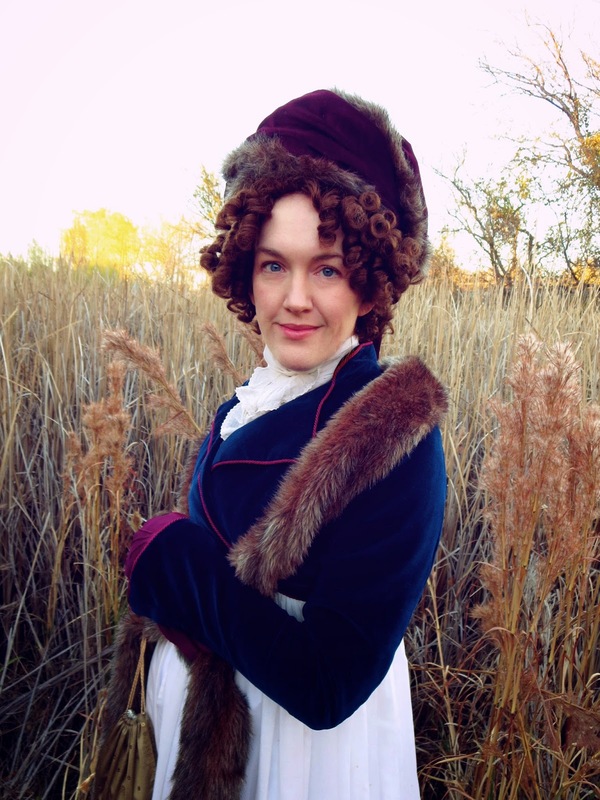 I also had a massive hair fail on the morning of the picnic and didn't have time to work out a plan B, so I decided to invest in a new wig to make sure that never happens again. I bought the Aneesa wig by Mona Lisa (you can sometimes find cheaper prices for this wig on Ebay), and I think it's a nice match for the short cropped curls that you see in some of the fashion plates from this era. I took sections of hair and brushed them out, then I wrapped them around my finger to make distinct ringlets. It's sort of a silly look, but it seemed very Gallery of Fashion-esque, which is exactly what I was going for. 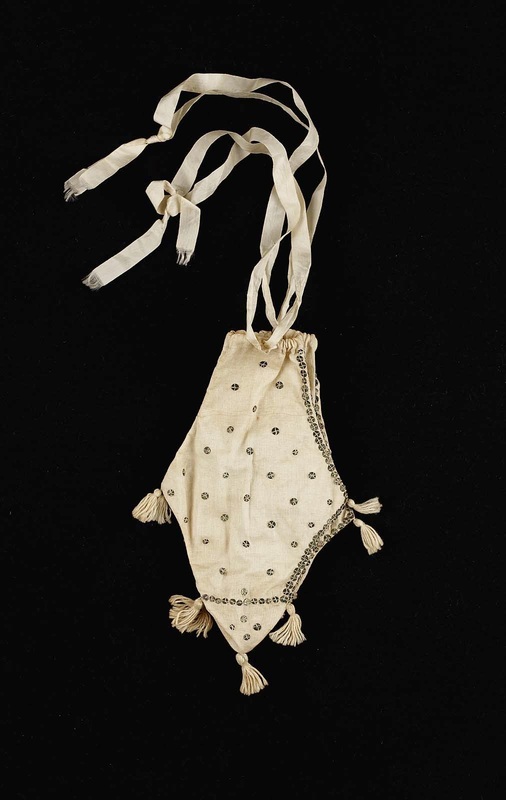 Next, I decorated a silk reticule with brass spangles. I made the reticule earlier this year, but it wasn't anything exciting, so I decorated it with a pattern similar to the bag shown on the left. My version is fairly subtle since the color of the spangles matches the silk so well, but I'm quite pleased with the way it turned out, and I discovered how fun it is to add spangles to things. I don't think I'll ever have a plain reticule again! The gloves were another quick project that helped to add some more color to my outfit. They are vintage gloves that I found at an estate sale, and they were originally orange. I over-dyed them with purple Rit to make them a burgundy color that would match my turban. The color is a little spotty in a few areas, so the next time I dye gloves, I'll be sure to wash them first to make sure any old grease or oil is removed, which can cause the dye to be absorbed differently in those areas. But it's nice to know that I can take boring old gloves and dye them any color that I want. I never even though about doing that before. 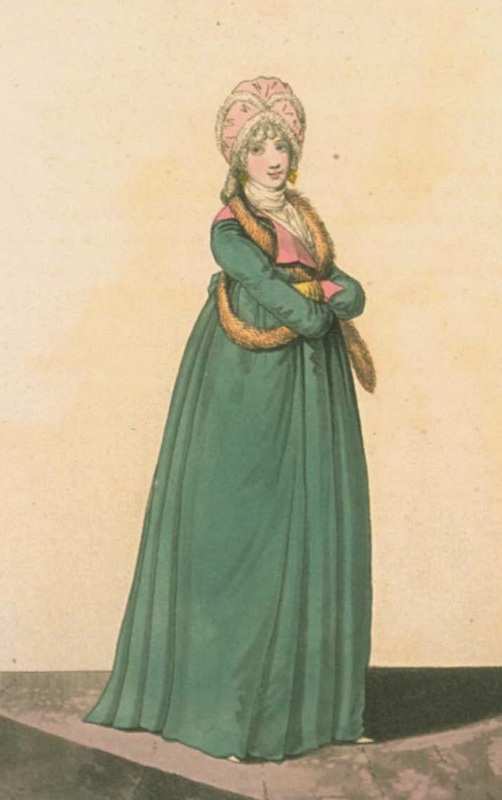 In the past, I wore my paisley shawl with this outfit, but paisley shawls don't typically show up in fashion plates until after 1800, so they aren't the most historically correct style to use with this period. 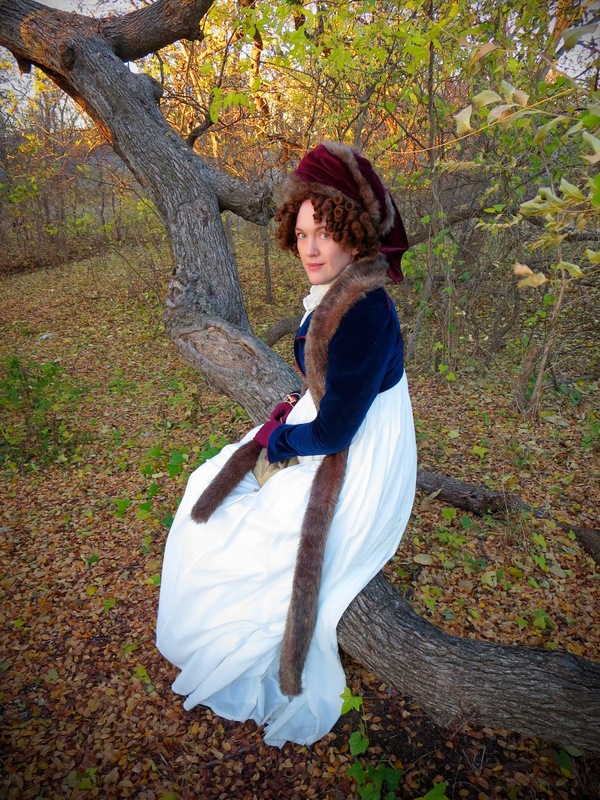 So I decided to make myself a fur tippet, which is an accessory that you do see often in 1790's illustrations. I had a small remnant of faux fur left over from another project, so I pieced it together and sewed it into a long tube. 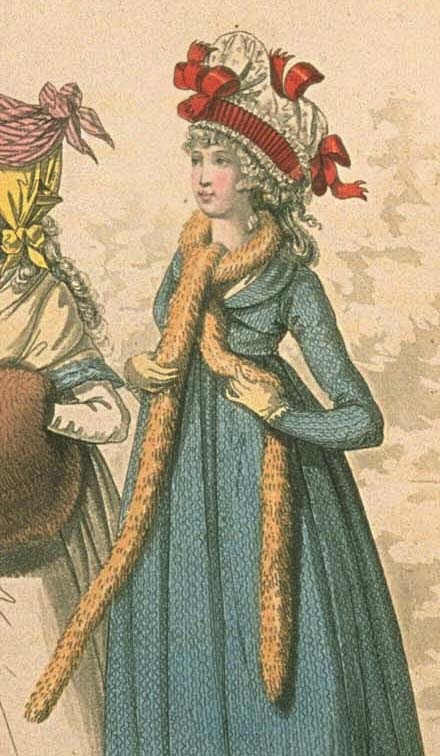 Honestly, it doesn't provide much warmth unless you wrap it tightly around your neck, but they do look pretty glamorous, so I guess that's the main point. 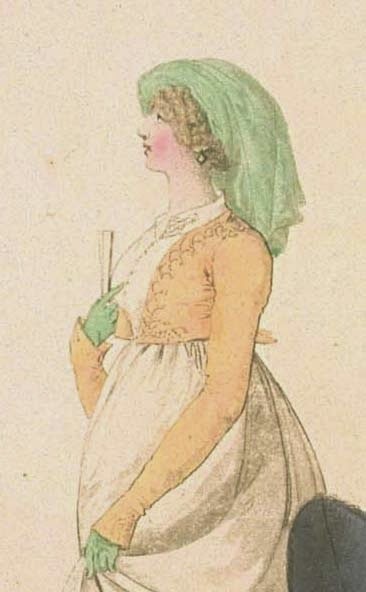 Finally, I made myself a high-necked chemisette to fill in the neckline of my round gown and make it more appropriate for winter. I made it out of a vintage baby gown that had been badly stained and torn and was headed for the scrap bin. But I managed to salvage enough of the plain cotton to make the chest piece and collar, and then I used the lace edging to create some long ties that I could arrange like a cravat. I think more than anything, the chemisette helped to keep me warm by covering one of the few exposed areas on my body, and I love the smart and sporty look that it creates - perfect for a hike through the woods on a November day. So I might have missed my goal of having these new accessories finished for the picnic, but I still had fun wearing them for my photoshoot, and I hope I get another chance to wear them to a real event in the future. You can see the full set of photos on Flickr, and here are a few more of my faves. 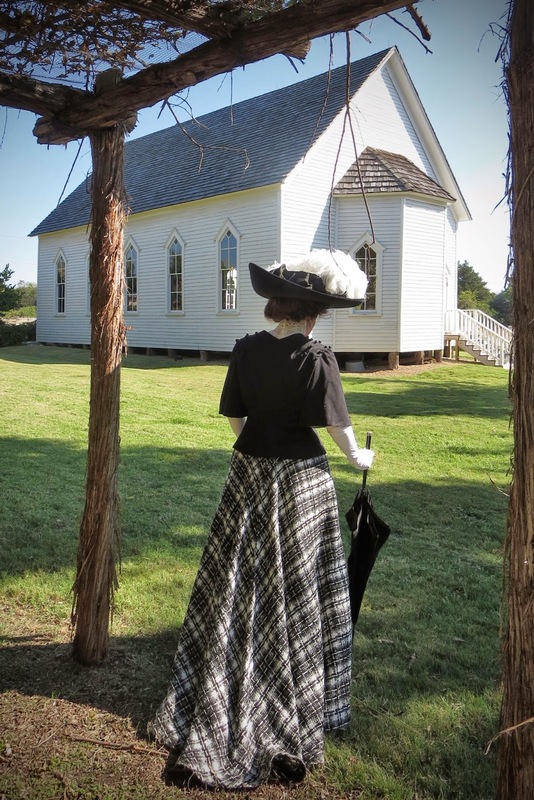 I knew I would be incredibly busy at the DFWCG's Mourning Tea, so I stopped by a beautifully restored Victorian chapel and cemetery near my home so I could take a few pictures of my new half-mourning dress before the party. I was running short on time and never made it down to the cemetery itself, but I did get some pretty shots outside of the chapel. Here are some of my favorites, and there are a more on flickr. 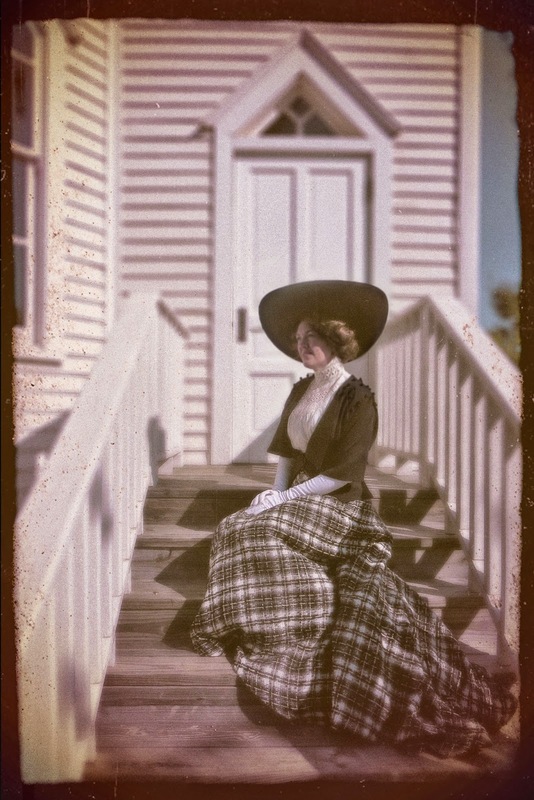 I'm also having fun turning these into faux-autochromes and Longchamps-style photos, so I'll probably keep coming back and replacing these as I have time. I'll start by reposting my original inspiration from a 1908 edition of La Mode Pratique, followed by two photo where I tried to copy the poses shown in the illustration. I didn't intend to copy every last detail of this dress, but I think I managed to capture the over-all feel of the fashion plate pretty well, which was my main goal for this project. 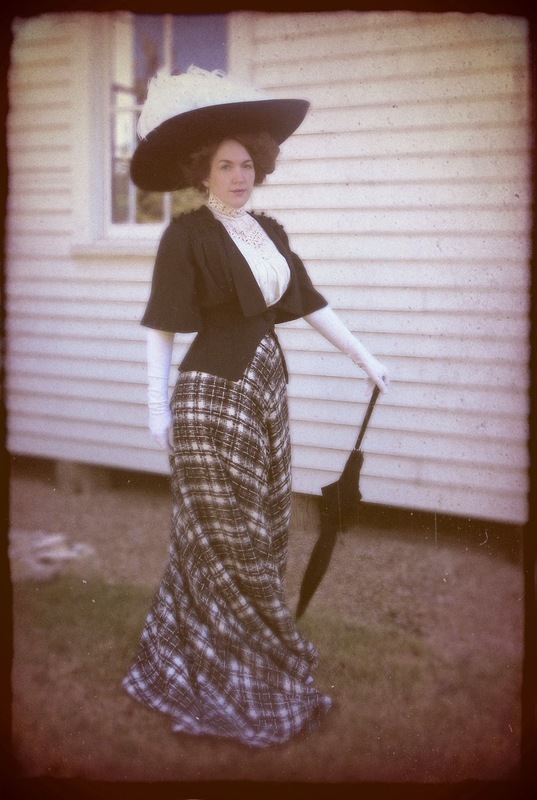 Out of all the things that I create, nothing beats the satisfaction of recreating an outfit from a work of art. There's just something magical about seeing an artist's depiction of fashion once again turn into a living, breathing, moving thing. 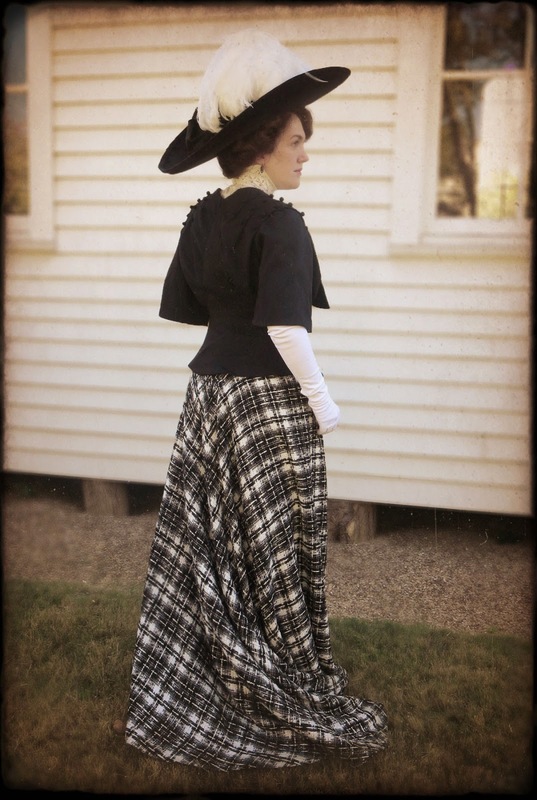 Thanks for following along with my little mini-diary about this dress, and if you missed the earlier entries, you can go back to read about the corset, skirt/blouse, jacket, and hat. 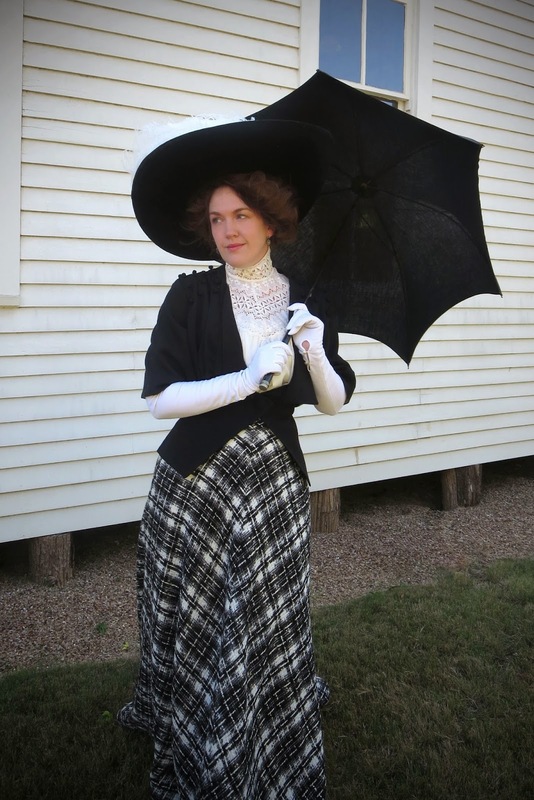 One of the main reasons that I wanted to make an Edwardian outfit for the DFWCG's Mourning Tea Party was because I've always wanted a proper "Merry Widow" hat, and a mourning party seemed like the perfect place to wear one. These fabulously oversized confections were inspired by the operetta The Merry Widow, which took London by storm in 1907 and sparked a huge craze for the large hats worn by the leading actress, Lily Elsie. 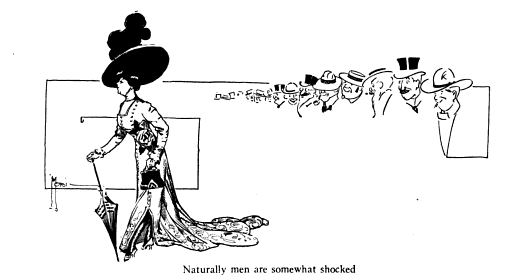 Judging by the the frequent mentions of Merry Widow hats in magazines from from this period, it seems that men found them annoying, cartoonists thought they were ridiculous, moralists saw them as sinful, and women just couldn't get enough of them! 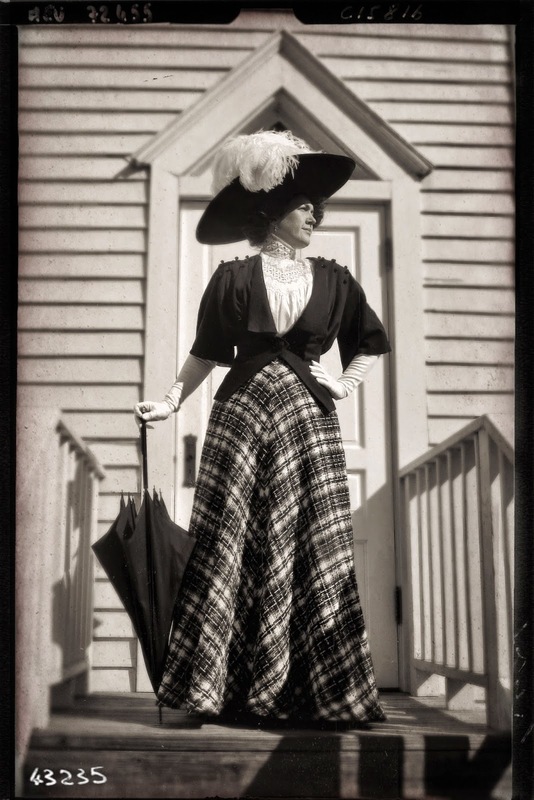 They continued to grow in size throughout the end of the Edwardian years, ultimately reaching the largest expanses ever seen in the history of fashion before finally shrinking back to a more manageable size by the mid-1910's. 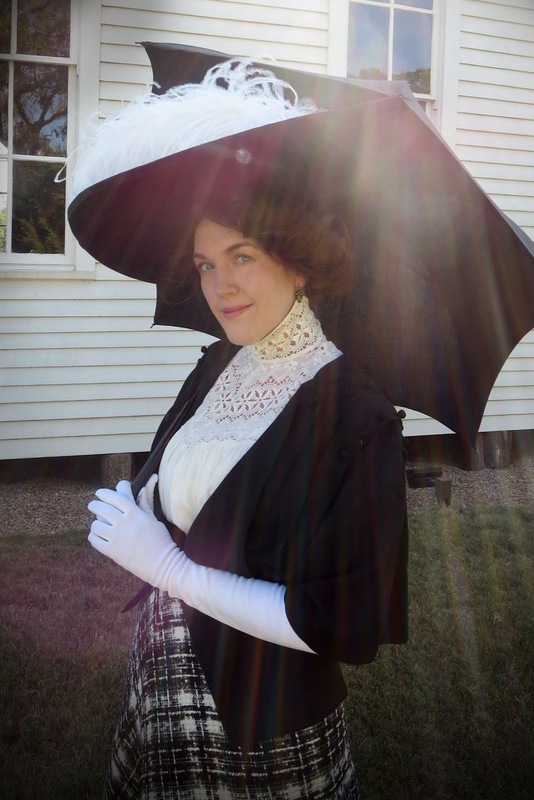 Since I also happen to be a huge fan of ridiculous headwear, I decided to make my own Merry Widow hat with proportions epic enough to make my Edwardian ancestors proud. I've noticed from handling some wide-brimmed antique Edwardian hats that they are often hard as a rock, so I suspected that they used cardboard as a base instead of buckram and wire. Modern sombreros also use cardboard bases, and they are the only hats that I know of that are still as large as Edwardian Merry Widows, so I decided to experiment with converting a sombrero into a historical style. Although sombreros often show up on Ebay or Etsy, the cheapest one that I could find was this hat from the Mariachi Connection (as a bonus, they seem to have frequent sales too). The sombrero is plain enough that you might could replace the crown only and skip recovering it, but it is covered with a a velvet-like synthetic material that I wasn't crazy about, so I decided to deconstruct the entire thing and see if I could cover the base with my own fabric for a more sophisticated look. My first step was to remove the edge binding and decorative cords and then pull the fabric off the cardboard base. The cords and binding are sewn all the way though the cardboard, which is impressive considering how hard the base is. The fabric came off easily though, and it seemed to be glued down with something similar to rubber cement. The fabric on the entire top side of the brim was glued down, but the bottom and crown were only glued around the edges. It looked like the cardboard was shaped over some sort of block that formed the rolled edges of the brim, and the larger upturned side had several places where the cardboard was cut and overlapped to make it curl up more smoothly. Once the fabric was removed, I cut off the crown and enlarged the opening for the head to a larger size, although I did not worry about the exact size of the opening until the crown was attached. The next step was to construct a new crown for the hat. I found an article in a 1909 edition of La Mode Illustrée that gives a pattern and instructions for making a similar style of hat, so I used those dimensions for building my new crown. The article called for a crown that was was 10.5" in diameter, 33.5" in circumference, and 4" tall. I built my crown using a double layer of buckram with wire around the top and bottom edge, and then I covered it with cotton velveteen. It is a bit silly looking on its own, but I had fun modeling it to show you exactly how huge the crowns of Edwardian hats are supposed to be. It felt like I'm wearing a lampshade on my head at this point, but you really do need to make the crowns this large or else they don't sit correctly over the large hairstyles of the period. After the crown was finished, I then covered the brim with my velveteen. I decided to use spray adhesive to attach the fabric to the cardboard base, and I used Scotch brand Super 77 for this project, which worked quite well. Just be sure to spray the adhesive outdoors, and do it on the grass or on newspapers because the spray glue is incredibly sticky, and it is very hard to remove if you get it on something by accident. It took me two tries to attach the fabric to the cardboard base smoothly, and there are a few tricks that I learned that made my second attempt much more successful. Please forgive my quickie hand-drawn diagrams, but hopefully they will help to illustrate the concepts. First of all, be sure to cut your circle of fabric a good bit larger than the actual size of the hat, and don't cut out the center hole until after it is completely stuck down. It is hard to line everything up exactly when applying the fabric, and you really only have one shot at getting it on there right with the spray glue. The first time I tried it I was a little off center, and I didn't have enough fabric on one side to completely cover the edge. The second time I tried, I cut wider selvages, and I also marked the middle of the brim and the middle of the fabric with chalk so I could stick the center down first and then work my way out to the edges instead of working from one side to the other. I did this to the top side of the brim first, and then I repeated the same process on the bottom. 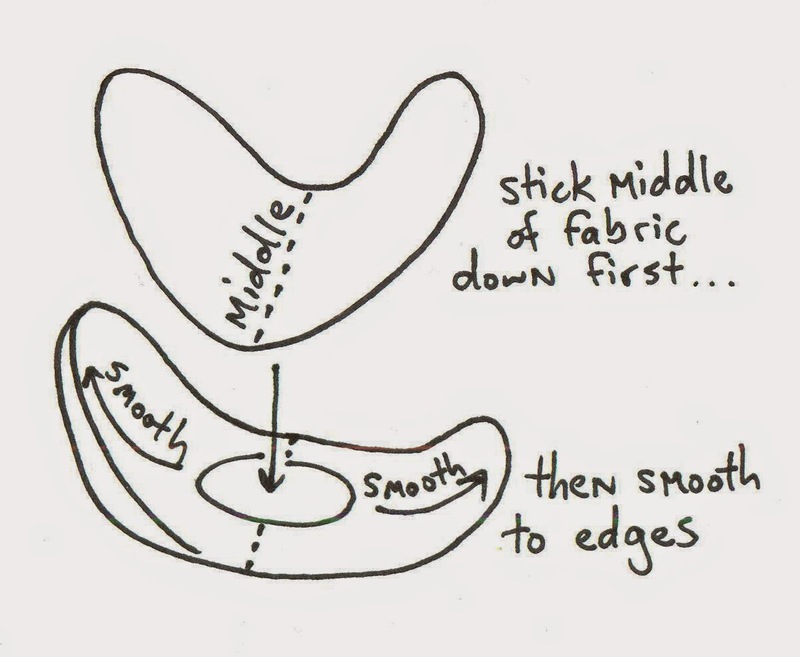 Once it is all stuck down, then you can trim off the excess fabric and cut the opening for the crown. The other tip that I learned is that the direction of the bias is incredibly important when trying to get the fabric to lay down smoothly over the curves in the brim. The first time I glued down the fabric, there were small wrinkles around the edges of the hat, but on the second try, I managed to smooth out all of the wrinkles by stretching the fabric on the bias in specific areas. 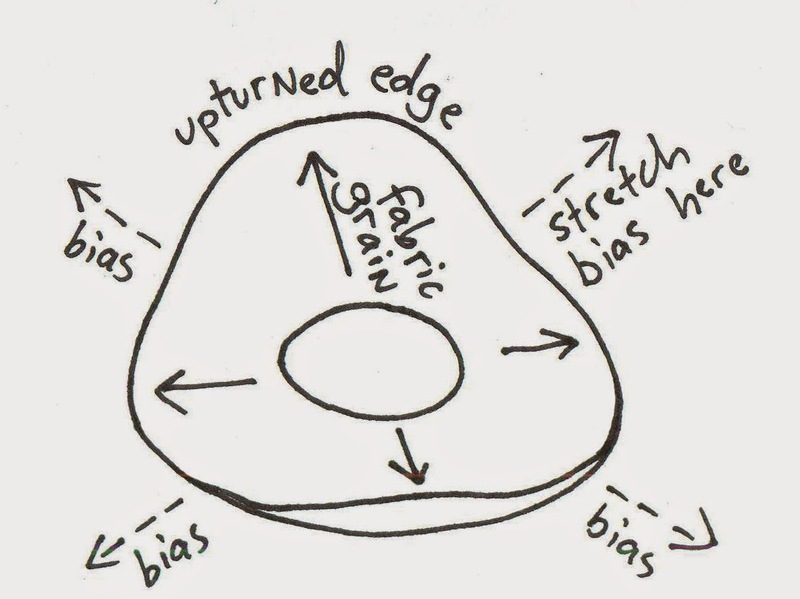 I discovered that the straight grain needs to run up to the highest point of the upturned edge of the brim, and you will do the most stretching and smoothing along the sides of the upturn. The spray adhesive actually stays tacky and the fabric is repositionable if you don't press it down hard, so I started by sticking down the edges of the hat where the straight grain runs, then I would stretch and smooth the bias sections until all the wrinkles were gone. After stretching, then you can firmly press everything down to get a permanent bond. The brim was finished by sewing a bias strip of the velveteen around the outside edge. This step needs to be done by hand with a curved needle, and it was a pretty long and tedious process considering how large the brims is. You probably could glue some trim around the edge instead, but I think the hand-sewn edging looked really nice, so I'm glad I took the time to do it that way. 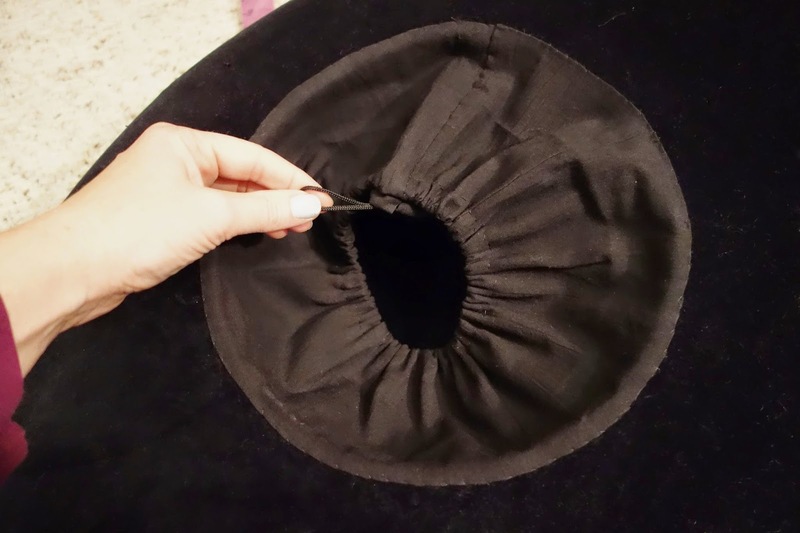 Once the brim and crown were both covered with fabric, I attached the crown to the fabric on the top side of the hat brim - again by hand-stitching it with a curved needle. After the two parts were sewn together, I then went back and cut the round opening in the brim larger so that it fit the position and shape of the crown. The last step was to hand sew a strip of cotton around the edge of the opening for the lining of the crown. I made a casing on the top of this strip and ran a drawstring though it so that I could gather it up and adjust how high or low the hat sits on my head. So at this point, it was finally a real hat, although quite an awkward looking one without the decorations. But never fear, because hats like these are all about the feathers and flowers and fluff. 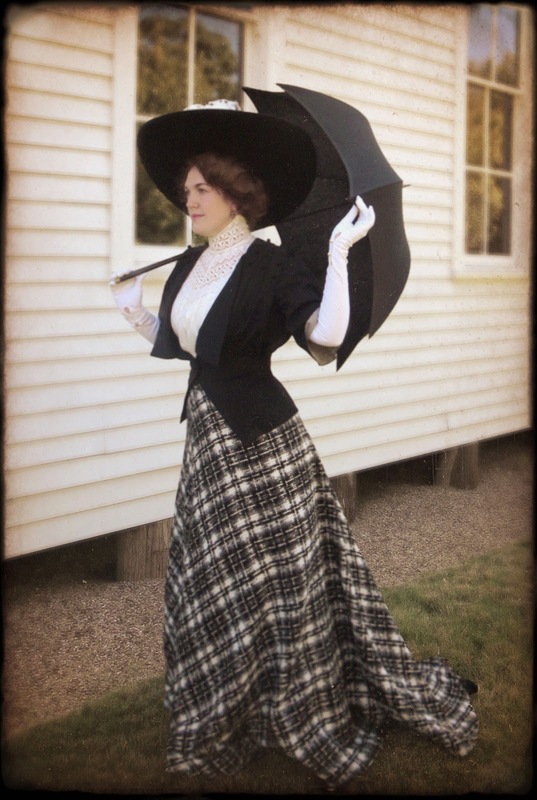 In the photo series below, you can see the hat as it looked bare, then with a super-wide vintage moire ribbon tacked around it, and then in the final shot, you can see the finished look with 5 extra long ostrich tacked across the front. Much better! 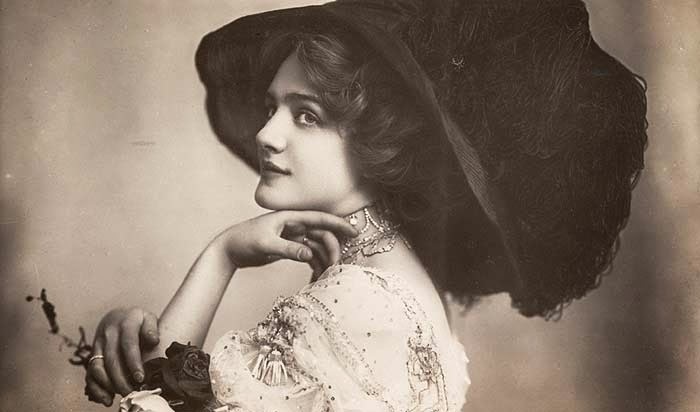 The last secret to making a Merry Widow hat look authentic is creating a large enough "Gibson girl" hairstyle to support a monster-sized hat. 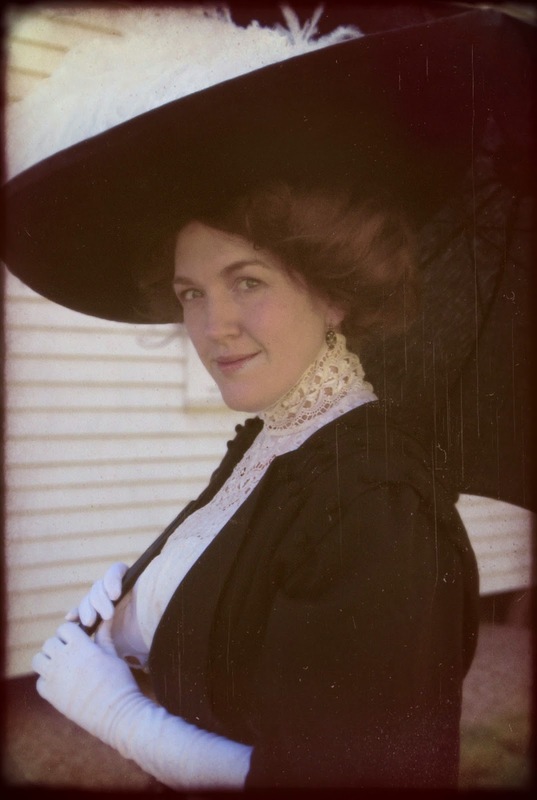 I taught a class on Edwardian hairstyles a few years ago, so I already had a variety of rats and hairpieces that I could use, plus a collections of images on Pinterest to give me inspiration. My hair is just past shoulder length right now, so I wore a long wavy wig to give me some more length to work with. I used the Stephanie wig by Wig America, and I hid the edges by combing some of my own hair over it. The poofy sections along the front and sides of my head are made by combing the wig hair over a large rat on one side and a foam pad attached to a comb on the other. I made the rat by stuffing a stocking with wool, then I wrapped some lose braiding hair around it, then I covered it with a hair net to keep it tidy. On the back side of the rat, I have two toupee clips stitched to the stocking to hold it in place on my head. The smaller foam pad is something that I bought at a beauty supply store recently. It worked okay once I wadded some of the extra length of wig hair over it, but it was harder to secure, and I plan on replacing it with another home-made rat in the future. Although 1910's hair-styles concentrated the fullness at the back of the head, earlier Edwardian styles were more like a pompadour with the bulk of hair hanging over the forehead and fullness at the top and sides. To create a similar look, I did not pad the back of my hair at all, and I just twisted the back length up and pinned it into to loose curls at the crown of my head. I was in a rush on the day of the party, so my hair is a bit messier than I intended, and I could have done a better job of covering the rat and arranging the back, but it still worked out okay, and I'm sure I'll do better next time. 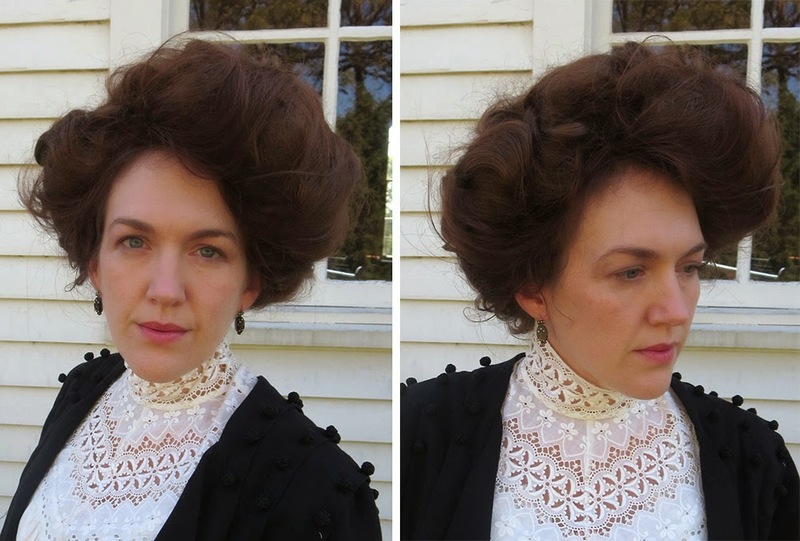 The large size of these Gibson girl 'dos are a bit of an adjustment if you are not used to wearing big hair with your costumes, but you really do need this sort of bulk to fill out the bottom of the crown and support the wide expanse of brim. 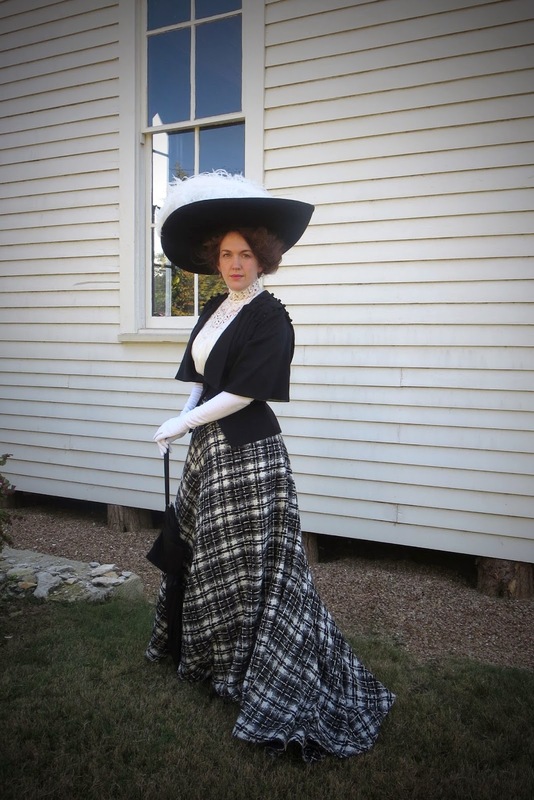 Be sure to check back later this week for more pictures of my new Merry Widow hat and the final reveal of how the whole outfit looks together!